Motor Passenger Ship, Citra Mandala Sakti, ran aground in the Straits of Bali or about 500 meters before berthing at the Port Gilimanuk, Jembrana regency, Bali. As of Friday morning, the ship moored at sea corals on Thursday (30 August 2012), at approximately 9:30 pm, can not be moved. 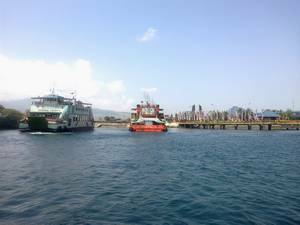 But all the passengers, departing from the Port of Ketapang, Banyuwangi regency, East Java, was declared safe and can be evacuated in stages starting at 00.00 pm to Gilimanuk port. Gilimanuk port administrators and PT ASDP Indonesia Ferry still investigating the cause of the accident ferry without causing casualties.